Premessa: questo non è un post pro-euro e non vuole esserlo nemmeno indirettamente. è un vero e proprio "laboratorio di anticipazione&avanguardia" sulle politiche monetarie iper-espansive e di deficit spending nelle economie "avanzate". Invece l'Abenomics sta FALLENDO nei suoi scopi ed il Giappone, dopo un boom fuoco di paglia (soprattutto del Nikkei...), rischia di tornare in Recessione (o forse lo è già). Giappone già nuovamente in recessione? “Weak industrial production data from Japan today raises concern that the world’s third-largest economy may be back in recession, challenging Prime Minister Shinzo Abe’s growth strategy.” In fact, output which was down 1.5% between July and August (and down 2.9% over August 2013) has fallen in three of the past five months. Even corporates are becoming more gloomy. The latest Bank of Japan quarterly Tankan confidence survey fell back three points from June, the second successive fall since it peaked just before the tax hike. As the FT’s Ben McLannahan points out the Tankan numbers also suggested that “the recent drop in the yen – which fell more than 5 per cent against the US dollar in September – remains a double-edged sword for Japan Inc, pushing up profits for big exporters with extensive overseas operations while squeezing the margins of smaller manufacturers, which struggle to pass on the higher cost of imports.” Unsurprisingly it is the small manufacturers who are most disgruntled about the impact of Abenomics. The economy fell between April and June by an annualized 7.1% and even though the rate of decline will have been much slower from July to September all the indications seem to point towards the possibility that growth was negative, which would mean that at least technically Japan is back in recession. Abe is having more success with inflation, which is running at the highest level in nearly two decades. Yet even the inflation – which is at an annual 1.3% once you strip out the effects of the tax hike – has largely been driven by the rising cost of imports, and there are serious doubts whether even this will be sustained if there are not further yen devaluations. 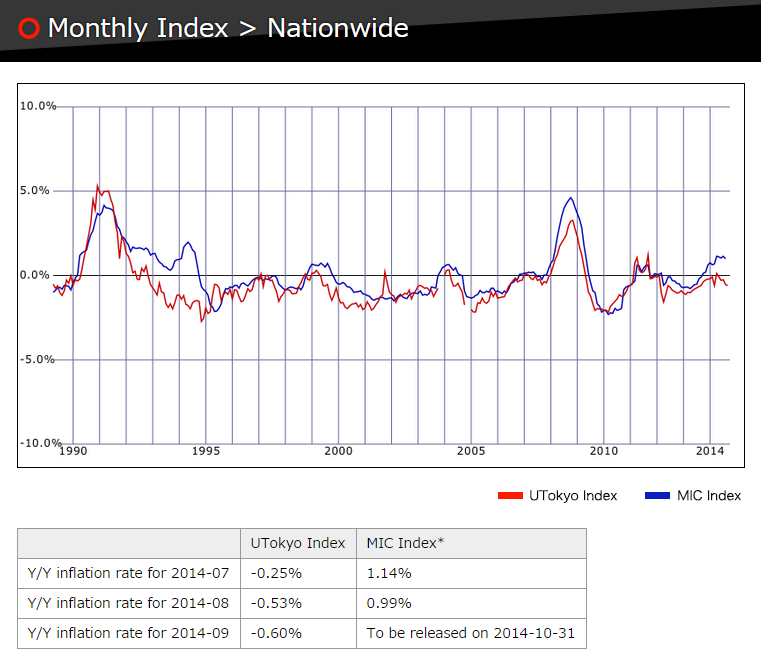 The Tokyo University frequently purchased items index (obtained from supermarket scanner data) shows underlying inflation continuing to ease. But even the inflation proves to be problematic in a country where wages constantly fail to rise significantly. 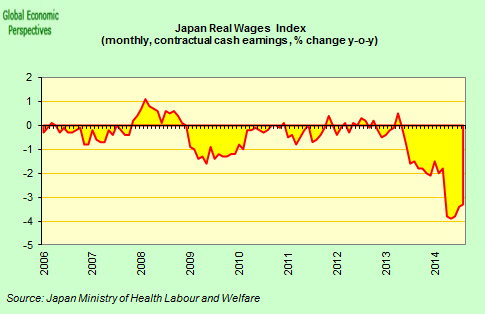 The fact that non inflation adjusted monthly wages rose at the highest rate in I don’t know how many years makes a nice headline, but the fact that real take home pay keeps falling due to the impact of inflation gives a more realistic description of the difficulties involved in trying to refloat Japanese consumption.. The theory that is being applied assumes that Japan is in some sort of “temporary” liquidity trap due to the presence of a balance sheet recession, but what if the trap is permanent rather than temporary – see my Paul Krugman’s bicycling problem – and is the result of the country’s demographic evolution. In that case what – apart from all participating in a mass Labour of Sysiphus – do we really hope to achieve? A policy which is exclusively aimed at attaining a positive natural rate of interest when the natural rate may be permanently negative seems of dubious value at the least, and when this policy in addition proves unable to drag the economy stably out of recession and only benefits the 10% of the Japanese population who have financial assets and senior management in large global companies, then in its application it seems almost to be noxious. A state of affairs which doesn’t escape the attention of the average Japanese in the street. Meanwhile the Japanese government recently announced that the number of people over 65 reached 25.9% of the population in September – up 1.1 million from a year earlier. Tic-toc, tic-toc. Firstly, a weaker yen does not necessarily result in lower export prices (on a local currency basis). Export prices also have a more limited impact on export volume than global demand, making the latter a more important determinant for exports. Vi ricorda qualcosa tutto questo? E' applicabile in buona parte anche ad un (ex)ridente Penisola nel mezzo del Mediterraneo? Non è che forse forse è un filino azzardato credere fideisticamente che il ritorno alla lira, alla sovranità monetaria ed alle politiche di deficit spending siano una panacea dei mali italiani? 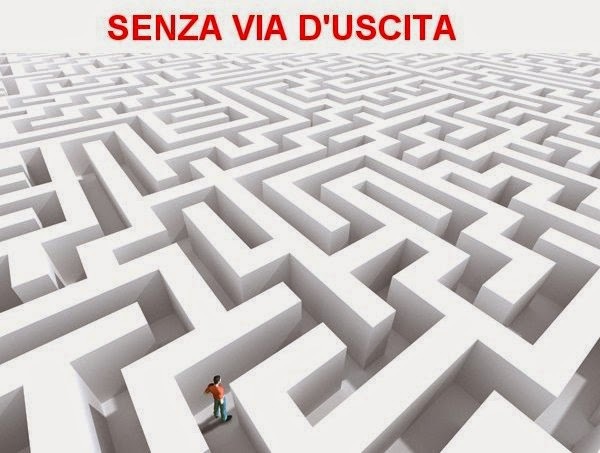 siamo in un VICOLO CIECO per il quale non esistono più soluzioni collettive ma solo soluzioni personali/di gruppo. Ma ma ma..E la moneta sovrana? Lo stampa-stampa? Il +deficit fai +cresci? 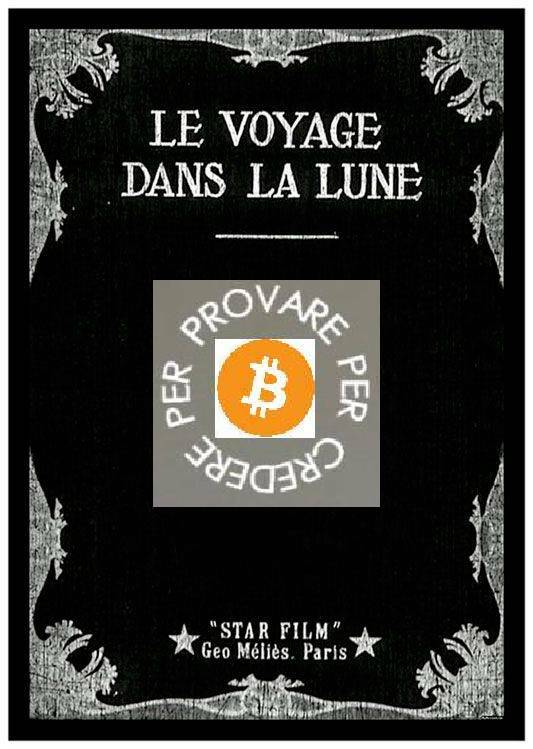 La MMT? It's been quite a while since my last look at secular Japanese market and bond data. We're now just a few months from the 25th anniversary of the Nikkei 225's bubble top in 1989. The latest cyclical rally in the index hit an interim high at the end of December 2013, up 99.6% from its interim low in November of 2011, and a more recent interim high in late September was up 100.5% from that 2011 low. The steroid effect of massive monetary intervention has evolved into an ongoing drama of volatility. What about Japanese government bonds? The closing yield of the 10-year bond on the day the Nikkei hit its 2011 interim low was 1.53%. It was cut in half to 0.75% a year later when the Nikkei hit its November 2012 low shortly before the central-bank-driven rally. The yield fell to its 2013 low of 0.44% on April 4, the day that the Bank of Japan disclosed its radical redo of monetary policy. It rebounded to 0.94% on May 29, but it has since been nearly halved to 0.50%. Compare that with the US 10-year note, which closed Friday at 2.31%. Here's a quick review of the Nikkei 225, the 10-year bond and inflation over the past three decades. Japanese Bond Yields: How Low Can They Go? Government bond yields in many safe-haven countries have plunged since the Financial Crisis. The US 10-year, now at its 2014 low at 2.31 percent, is well off its historic closing low of 1.43 percent set in July 2012. The lesson from Japan is that the trend toward lower yields can last a very long time. Here is an overlay of the nominal Nikkei (log vertical axis) and the 10-year bond (linear scale) along with Japan's official discount rate. The 10-year yield hit its all-time low in June of 2003, over 11 years ago, at 0.43%. According to Bloomberg, it closed yesterday at 0.50%. *Note: I couldn't resist adding a trend line on the index price, which fractionally broke above trend briefly at the end of September. Now check out the inverse correlation between the currency and the equity index over the past three years. What we've seen in Japan is an amazing chapter in the ongoing drama of economics and the market -- a drama that no doubt has more in store for us.